Imagine if you could take public transit from downtown Toronto to Blue Mountain in Collingwood? Or to Windsor in the west? Ottawa in the east? Niagara Falls? Montreal? 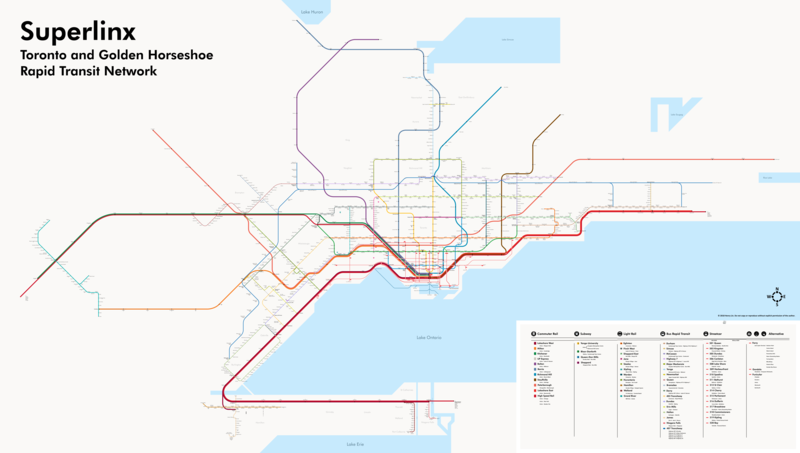 It wouldn't be cheap, but it would be possible under the layout of Toronto's latest transit fantasy map — an enormously complex network of subway, bus, commuter rail, light rail, streetcar, ferry and even gondola lines. Called "Superlinx: Toronto and Golden Horsehoe Rapid Transit Network," this work of art was brought into existence by University of Toronto Architecture student Henry Lin. The Superlinx transit fantasy map would link almost all of Southern Ontario by a combination of bus, subway, streetcar, light rail and other forms of transportation. Click to embiggen. Image via Henry Lin. You may remember one of Lin's other transit fantasy maps from when it went viral in February. People raved at the time that it might have bee the best transit plan floated so far — and if you've been following this stuff for any amount of time, you know that a lot of plans have been floated. Lin's latest map hit Reddit on Thursday, and it's even more impressive than the last. You could seriously get lost for hours just exploring it and dreaming about the possibilities of a system that connects all of Southern Ontario. "It's many numerous project maps compiled into one," said Lin to another Redditor when asked how long the project took. "I've done individual maps for specific lines, so it's technically a long time coming for this map." "This specific map took on and off a month to make," he continued. "Granted I have other priorities like being confused by Westworld, so it was like a few or more hours a day working on it." The people of Toronto appreciate your work, Henry — however much it might make us long for something we'll likely never have.